Just click an image to launch its full-size version. You can then download the target and print it out on regular 8.5″x11″ paper. Now you have fun Halloween-themed targets to bring to the range this week. Share the post "Get Four FREE Downloadable Halloween Targets"
Summer is here, so it’s time to focus on fun and games. Here are three speciality targets with game themes: Dartboard, Billiards Table, and Bowling Alley. Each target features multiple bullseyes. Shoot the dartboard like a regular game or make up your own sequence. For the billiards target you can shoot the bulls, or the balls, or both. Click any target to load FREE higher-resolution PDF files which you can download. Then print the targets and take them to the range for a fun shooting session. 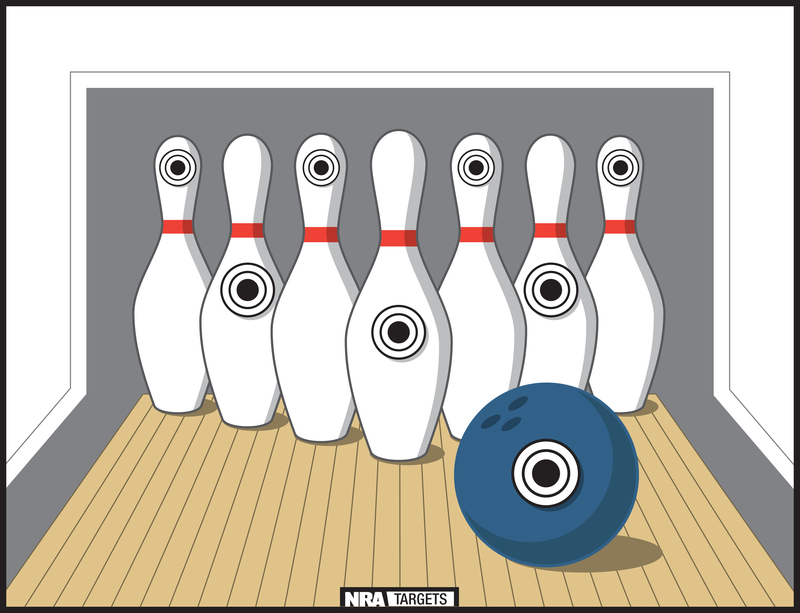 A big thanks to our friends at NRABlog.com for creating these colorful “fun & games” targets. Enjoy! Share the post "Download Free Summertime Fun & Games Targets"
The NRA Blog has published a nice set of super-sized playing card targets. These boast a variety of aiming points (large and small) so they work well for rifles as well as pistols. On the Queen of Diamonds, aim for the large bull-style designs in the “red zone” or aim for the smaller dots on the periphery. For a real challenge, try to shoot each one of the 26 small red diamonds in the curved, central white stripes. On the Five of Clubs target, you can aim for the smaller club symbols, or shoot for the orange, purple, and green “dripping paint” bulls in the large, central club. The Ace of Spades target offers a colored bullseye in the center, plus a very small bullseye in the letter “C”. Last but not least, the Eight of Hearts is a perfect choice for a trip to the range on February 14th, Valentine’s Day. Share the post "FREE Printable Super-Sized Playing Card Targets"
We’ve learned that many first-time visitors to AccurateShooter.com may come in via a link to the Daily Bulletin rather than through our home page. As a result, they may not be aware that there is a wealth of other content available to our readers. Our Shooters’ Forum, with nearly 11,000 registered members, is one of the best places on the web to discuss precision shooting and advanced reloading. We also offer FREE Forum Classifieds. On the editorial side, AccurateShooter.com offers hundreds of pages of content, with thousands of photos. Our Cartridge Guides are considered definitive sources of tech info for popular match calibers, and our Guns of the Week articles provide in-depth reports on outstanding custom rifles, most of which have competition pedigrees. In addition, we offer videos, gear reviews, book reviews, an event calendar, and even FREE downloadable targets. Share the post "AccurateShooter.com Highlights: Forum, Free Classifieds, Free Targets, and 100s of Articles"
Recently, in the Daily Bulletin, we ran a story on Czech Rimfire fun matches. Many readers were interested in starting similar matches at their own clubs here in the USA. The Czech shooters have creatively combined many fun shooting scenarios using a wide variety of targets. One of the rimfire fun matches held by Robert Chlapek’s Czech Shooting Club is an event called “Smallbore Sniper Rifle”. Shown below are some of the targets used. CLICK HERE to download ALL targets as a 1 megabyte .ZIP file. Targets are .pdf files. Each competitor has one minute to shoot his first “cold-bore” shot (without zeroing) on a bullseye target. The referee checks the target, then the shooter engages nine (9) hostage-situation targets in ten minutes, with one shot per target (re-zeroing allowed). Total time is 11 minutes. 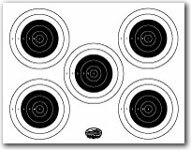 There are eight, named bullseye targets (Alpha, Bravo, Charlie etc. ), set at 50 meters. Each shooter is assigned a particular number. The Referee will call a shooter’s number and a target title, such as “Shooter FIVE, DELTA”, and immediately start a timer. The shooter has just 3 seconds (between timer beeps) to take a shot on the designated target. Each shooter takes a total of four (4) shots, one at a time, on command. Here the shooter has to quickly fire three shots on three targets AFTER doing physical exercise (knee-bends or dips). This drill tests the shooter’s skills when shooting with a high pulse rate. When the referee calls “Start” the shooter must do five exercise reps, then shoot three rounds on the clock. The score is the amount of target points (times 5) divided by the time in seconds. In this formula, time counts as much as the target points, so the “sniper” must shoot accurately, but also quickly. This involves two 5-shot strings, each completed in five minutes. The first string is shot standing, but the shooter may use a vertical steel post for stabilization — simulating a tree in the forest. In the second 5-minute stage, the shooter must fire five shots (at a smaller target) from kneeling or seated position, but he can use a chair as a rest. This stage is designed to simulate conditions when you can’t shoot prone effectively (such as when there is tall grass). A. “36 Smileys” — Each shooter must find, identify and hit ten targets between 36 other very similar “smiley faces”. Time for this stage is 10 minutes. B. “Hostages in Windows” — Shooters must shoot very quickly, trying to hit eight (8) targets in just 75 seconds. Points are deducted if you hit the hostages. C. “Hanging Beer Mat” — This scenario tests concentration and patience. A hanging beer mat suspended from a thin line has three small targets on each side. To “engage” all six targets, you must allow the mat to “twist in the wind”. You are allowed only 6 shots total — one per target. The shooter must choose and hit five central target dots, one shot per circle. The smallest dots have the highest score values. A miss counts zero. This is similar to the “know your limits” dot targets used in USA rimfire tactical matches. CLICK HERE for results of a recent Czech Smallbore Sniper match, with photos. Share the post "Test Your Skills in "Smallbore Sniper" Matches"
Recent visitors to the AccurateShooter.com site may not know that we have an entire set of FREE TARGETS. There are sight-in targets, load development targets, Benchrest Targets, NRA Highpower targets, Scope Testing Targets, even a special set of Fun Targets. Most of the targets come bundled in .zip archives, so you can easily download multiple targets with one click. The targets are saved in .pdf format, so they are easy to print and the scale is correct no matter what your screen resolution. Here Forum member FireMedic shows some fine shootin’ with our basic Accuracy Target. With small, red diamonds and extended black lines, this target allows very precise aiming at 100 and 200 yards. The gray dot on top provides a reference point for a 200-yard zero. FireMedic reports: “My 30″, 12 twist, 3 groove does pretty good for an old Savage chambered in .308 Win.” With an average group size of 0.208 inches we’d have to agree. Great Shootin’ FireMedic! Here are two fun targets you might enjoy. The Atomic Target was originally created as a contest for our readers. The design is by Michael Forester of Auckland, New Zealand. Hit the bigger green and red neutrons, then try your luck with the smaller electrons. In the center, go for true “bug-holes” with our Fly Shoot Target. Watch out for the bio-hazard rings! 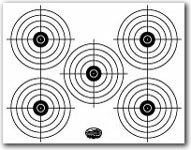 Share the post "FREE Printable Targets for All Purposes"